1. Donaghmore. Detailed View. West Face. Cross Shaft. 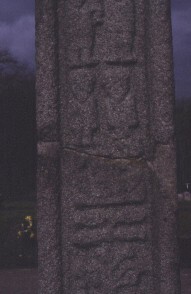 This is a composite cross, re-erected in 1891. It does have roll mouldings at the edges, but the representations on the faces of the cross are not framed and without obvious panels are at times difficult to decipher. Cross Shaft detail, panel W2, Just above the branches of the Tree of Knowledge from the panel below, in the scene Adam and Eve, the scene W2 is Noah's Ark. The ship is depicted on the water with 3 heads in three windows below the deck. A bird, the dove(?) is perched on the prow, so much so that it necessitates(?) a small figure in the panel above. The two figures on panel W3 are unidentified, suggestions (because of the difference in size) are David and Goliath, or Abraham and Isaac.